Workplace stress may contribute up to $190 billion in health-care expenses and over 120,000 deaths each year. 15 minute meetings. 3 month strategic plans. The 1 Minute Manager. Lunch-at-desk. Business today is increasingly challenged to keep pace with quicker and shorter cadence of decision making, customer expectations, and cycles of change – leaving employees to constantly chase an impossible set of demands and tasks, which are re-prioritized frequently. Problems at work are more strongly associated with health complaints than are any other life stressor-more so than even financial problems or family problems. – St. Paul Fire and Marine Insurance Co.
Over half said they often spend 12-hour days on work related duties and an equal number frequently skip lunch because of the stress of job demands. Today, many organizations take better care of their machines and technology (ensuring they are maintained and in good health), than their people And yet, people are the foundation of innovation, excellence, serving and pleasing your customers. 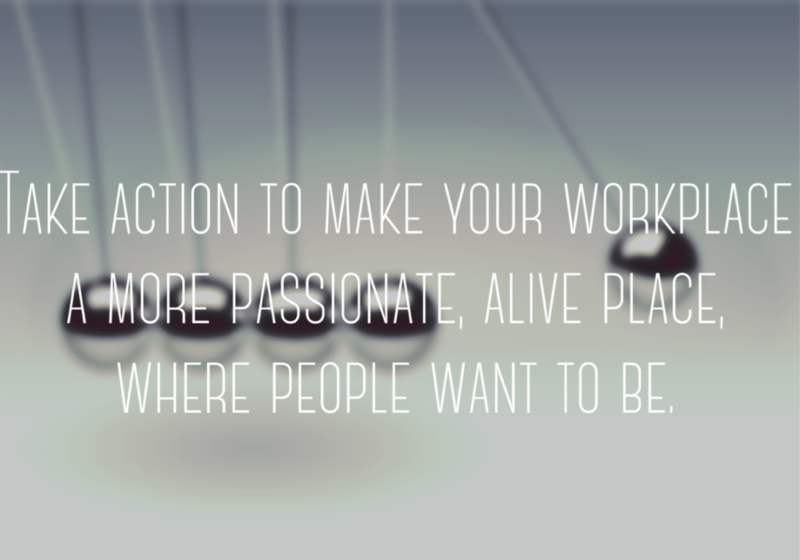 Now is the time to change the game, flip the switch, take action to make your workplace a more passionate, alive place where people WANT to be – not HAVE to be. We are in The Synergy Age. Beyond the Industrial, Information and Digital Age, thought leaders agree this era is a massive transformational period on a scale never seen before. One in which every aspect of our society is converging and being tested: Global law. Technology speed. Economic enmeshment. Political unrest. Business cultures versus cultures of origin. And, the sheer speed of change, is colliding with outdated Organizational Patriarchy*, a prior set of beliefs and assumptions in which people expected leaders to figure it out, and waited to be told what to do. This creates tension in organizations that still organize people, systems, and management practices based on a slower-moving, stable and predictable environment. *The term Patriarchy here, is used metaphorically to describe the masculine style of social organization in which the “leader” is the supreme authority, power is held by that authority, and the tribe or masses are expected to follow this authority without question. There are both male and female leaders in today’s society who perpetuate this style of thinking and structure. The disconnect in workplaces today, is less about change itself, and more about the tension created by the new demands of a rapid-change world, facing off against outdated expectations and ways of leading. Companies who commit to evolving people structures and systems to align with the new reality of the work world (and Millennial Generation core values of meaning and impact), will gain a competitive edge for top talent. A healthy culture of the future, is not necessarily cult-ish or in lock-step, but one where people WANT to be invested in the success of the team (and organization), versus showing up to gather a paycheck. In an era of shorter, faster decision and implementation cycles … human-centered teamwork and collaboration is the basis of high performance. It is no longer possible to move at the speed of change by relying on hierarchy and authority as the foundation of decision making, and expect people to come up with new ideas. To continue allowing duplicative, manual or bureaucratic processes to define performance, while expecting innovation and creativity. To define every rule, process and procedure in detail, while saying you want people to be engaged and empowered. To callously execute a RIF that has no safety net for people (or even a well-managed communication plan), while talking about how committed you are to people and their emotional health and well-being. To find new solutions amidst these seemingly opposite forces, is territory filled with ambiguity, and some risk. (If you don’t know how to manage it.) It also requires different skill sets from leaders: Strong, more transparent communication that builds trust. Being clear what you stand for, to your customers and your employees. The ability to foster true teamwork. A psychological understanding of how people are motivated and take ownership. From 15 years in practicing culture work, it’s clear to me now, that the high levels of stress people are experiencing, are less about change itself – and more about needing new solutions to HOW change is led. To rework HOW people are treated and engaged and empowered in the workplace so change is an act of creation together, versus a disconnected and awkwardly managed reaction to one-way directives. Universally, when we feel empowered, we are less stressed. (Even when we are facing difficulty, we do better when we are feeling we have control of our life.) When we don’t, we feel dragged along – and that is the source of resistance. (Not the change itself.) Leaders must learn to implement simple tools and practices in how to communicate and lead change, so people want to make the journey, versus feeling untrusting, suspicious, or jaded. People tolerate change and ambiguity best, when they understand “Why” leaders make decisions. It raises people’s stress level, feeling like pawns. (Or feeling that decisions that impact them are “not their business” – ie, treated like children.) The tendency of many leaders/organizations to issue fact-based one-way directives increases people’s stress. Leaders can lower stress by crafting thoughtful communication programs around change, that paints a picture of the context and reasons behind the change: How it links to the Vision, as well as to something employees care about. In building a communication-centric culture, think about what YOU would want to know if unexpected changes impacted your job. And, think about how to create a dialogue and get people’s fingerprints on HOW to create the change, before you implement it. I say “feeling” because leaders rarely mean to lie. Yet, they often spin the truth to mask negativity and satisfy the Legal Department. For an employee, the B.S. meter goes up and they assume leaders are lying. This raises stress through imagining (and gossiping about) the worst. To lower stress when there is a delicate or truth to tell, find a way to cascade the communication in real time (face to face), preferably with involvement of front-line supervisors. Tell people “This is what we can share, This is what we cannot share yet.” End with a pledge to ensure people will be updated as soon as knowledge is known. When there is no larger game plan everyone understands, constant new moves on the Field can leave people feeling like a wind-sock. How are we going to win in this business? How are we going to measure progress? What is my part in that? If every person in your company doesn’t know the simple answers to this, it creates stress. There will always be more to do than there is time in the day. You lower stress when you focus on providing people in your Department or Division, Quarterly themes (“This quarter, we are working on opening this new market, fostering customer care, and innovating around Product X.”) Also, fostering a culture in which managers and directors can say “no” – and know when and how to. It’s not only dull, it’s super-stressful. People aren’t machines – the relentless focus on numbers, results, performance, and work-work-work, maximizes stress. It is proven through neuroscience to increase cortisol, fight-or-flight responses, which in turn, lowers both perspective and creativity. Employers who expect people to be available via email and text at all hours of the day – without break – guarantee a high-stress culture for their people. We also need to play and socialize – at work! – to maximize productivity. Leaders can lower stress by intentionally creating interactions at work around fun activities, shared meals, comic relief, creative play. This also bonds people socially, which reduces workplace conflict. Relentless “do more with less” expectations. In today’s lean work environments, it is common for people today, to be asked to do what 3 people did 10 years ago. (ie, no change in the priorities or tasks, but fewer staff to do them.) If you are hiring people who are willing to work 60-80 hours per week, you are setting up for continuous attrition (this is not sustainable for most people). Or, the people who stay will be less healthy. (They often abuse alcohol, drugs, to unplug, which lowers productivity and personal health.) Leaders can lower stress by relentless prioritization of goals, and an active process to back-burner status on projects every quarter. (eg, Have a “Stop-List” session every quarter.) People focus better when their workload can be achieved with a reasonable schedule, and are encouraged to take frequent health breaks. Lack of conflict and decision management. If you are not teaching managers how to resolve conflict, clear the air, and make quick decisions (versus analysis-paralysis), you are creating a culture of chaos. (Think 5-year-olds running amok and fighting on the playground – it’s just an adult version of this.) You can lower workplace stress by providing tools and processes that create calmness and order, clear disagreements, and ensure there is ongoing conversation about how we treat one another – ie, ground rules for conduct. It’s time to stop talking about the hazards of workplace stress, and start aligning your intentions with true effort. The companies who do will not only foster competitive advantage for great talent, but will create cultures of satisfaction that can sustainably keep pace – and out-perform – in this new era of business.